Each winner received a certificate and a monetary prize. The theme for this year’s essay contest was “A Legacy for Today’s Lunenburg.” Contestants were instructed to read any chapter in The Lunenburg Legacy by Gay W. Neale and select a Lunenburg person mentioned who demonstrated (1) moral strength, (2) consideration for others, and (3) interest in the county. They were to describe the specific actions by that person which illustrated each of those three qualities. The historical society donated a classroom set of 30 books to the middle school for research purposes in preparation of the essays. In addition to introducing students to various aspects of Lunenburg’s history, the essay contest also provided experience with the Standards of Learning research requirement as well as instruction in the development of five-paragraph essays. The judges were pleased by the large number of interesting and well-organized essays submitted for the contest. 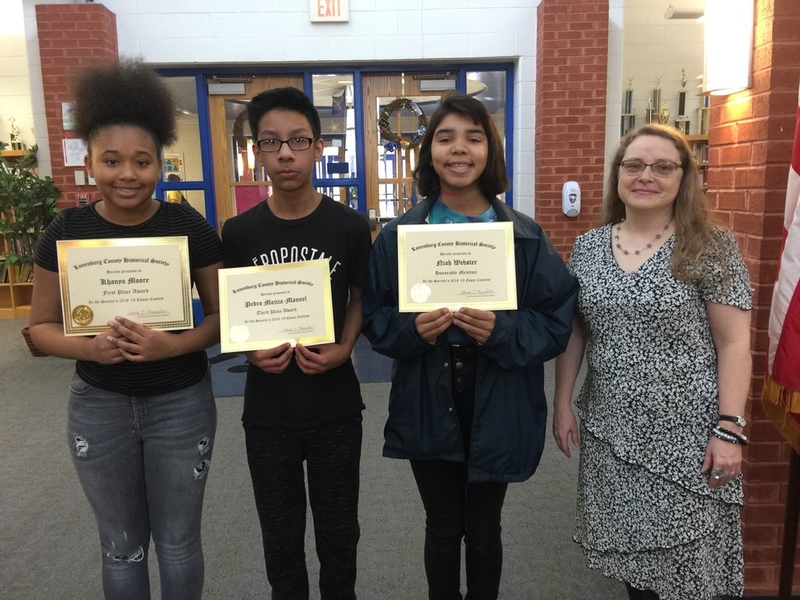 Photo: (Left to right) First Place: K. Moore; Third Place: P. Mojica-Manuel; Honorable Mention: N. Webster; Mrs. Brenda Wade, coordinator of the contest for the historical society. Not pictured: Second Place winner J. Foltz.